Edge computing is a very widely used term these days in lot of technology blogs, analyst reports, conferences and product announcements. Many companies are positioning themselves to grab a share of the edge computing addressable market. A lot of announcements try to position their existing products for edge deployments and few try to innovate for purpose built edge architectures. With so much noise in this space, it is hard to distinguish real innovations from small modifications in existing products. The companies that drive real architecture innovations for new distributed paradigm of edge computing and integrate it to deliver an end-to-end solution all the way from edge to backend data center (or cloud) will be the big winners in this emerging market. Every edge computing project starts with collecting data from IoT devices, sensors or mobile users, and the success of the project depends on ability to transform the data and into actionable intelligence while delivering a return on investment. Initial deployments start with connecting gateway-class devices to IoT devices/sensors at the edge and performing most of the data processing in the server class infrastructure in a backend data center or cloud. Gateways perform the data collection, aggregation, and filtering, and send the useful data for processing to a centralized cloud or data center. As we see larger scale deployments and more devices (e.g. smart factories, oil & gas, connected vehicles), server class infrastructure will move closer to edge to enable data processing and decision making at scale with lower latency. These servers may reside on-premise at the edge location where sensors and gateways are located or they may reside at a central office or micro-data centers between the edge location and backend centralized cloud. In Telco 5G and service provider deployments, these may be located in external harsh environments such as under a cell tower, on a street side, or simply in a central office. As applications move closer to the edge, it also requires all the underlying infrastructure services to evolve to this distributed computing architecture from edge to cloud. Management automation, security, virtualized network services (SDN), streaming storage at edge coupled with long term backend storage are just few examples of these underlying infrastructure services shown in the diagram above. New technology areas like artificial intelligence (machine learning / deep learning), programmable network fabrics, hardware accelerators (FPGAs/GPUs/SMART-NICs) and blockchain are also becoming critical in edge architectures. Ravi Pendekanti, Senior VP, Server Solutions Product Management and Marketing, and Patrick Moorhead, Founder, President & Principal Analyst of Moor Insights & Strategy discuss the emergence of edge computing. This need for distributing the processing all the way from edge devices/sensors to gateways to multiple tiers of enterprise server class compute between edge and backend cloud requires new architecture innovations at software and hardware infrastructure layers. Applying existing products doesn’t meet the scale, cost and performance requirements and leads to creating data silos in the distributed edge architecture. The new architectures will also lead to additional industry standards and open source activity to enable inter-operability between software and hardware ecosystem layers. These are critical to fostering collaboration between companies working on different technology domains and for delivering integrated solutions. Here are examples of some of the areas of infrastructure innovation we’re likely to see in distributed edge architectures. Emergence of new ruggedized and purpose-built server platforms that can be deployed in harsh environments at edge locations (e.g. warehouses, factories, retail). It is also leading to micro-data centers with embedded power and cooling for deployments in external locations like cell towers, parking lots and outdoor locations in a city. Edge computing also drives the need for a remote manageability architecture that enables complete life cycle management of hardware and software at the edge. This includes zero touch deployment, hardware/software monitoring, software updates and remote serviceability. We will see remote management as a service play a critical role in edge architectures. As applications move to the edge, the network services will also move to secure the distributed communication across edge instances and cloud. This includes virtual switches, load balancers, firewalls, IPSEC, TLS, SDN overlay networks, SD-WAN coupled with network telemetry and analytics. Due to the need for this distributed networking and security at scale, we will also see emergence of FPGAs and SMART-NICs in edge servers to free up the host CPU for customer applications. SMART-NICs are next-generation NICs (network interface adapters) that combine standard NIC functionality with FPGAs and smaller CPU cores to deliver a programmable network hardware data plane in the server. 5G deployments will drive need for additional network services (e.g. cloud-RAN, network slicing and deep packet inspection) that will make these FPGAs and SMART-NICs more important in edge architectures. We will see distributed security architectures emerge that monitor various network traffic patterns and resource consumption at the edge for anomaly detection and threat management. These will lead to security-as-a-service deployments where a user interacts with a centralized dashboard and policy framework, which hides the underlying complexity of security attacks in the distributed edge architecture. 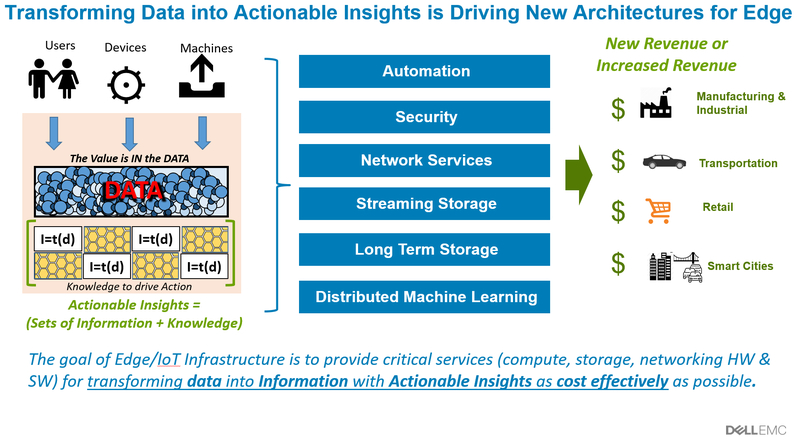 Machine learning / deep learning architectures are evolving for these distributed deployments wherein Inferencing occurs closer to edge location and training occurs further up or closer to the cloud in the edge infrastructure hierarchy. This is leading to new architectures for orchestrating machine learning / deep learning in these distributed deployments. Blockchain is a new emerging technology, but the industry efforts are full of projects that enable decentralized identify management, data security, M2M (machine-to-machine) transactions, payment processing and decentralized trusted compute environment at scale. These are game changers and has potential to completely evolve the architecture from centralized to a decentralized paradigm. Due to the complexity of these distributed edge architectures, customers will look towards working with a company that is both focusing on architecture innovations at edge and working on integrating these innovations into a one cohesive solution that enables hybrid computing all the way from edge to cloud. Integrating these technologies for ease of deployment will lead to emergence a new class of Hyper Converged Infrastructure (HCI) for edge. At Dell Technologies we are focused on these new architecture innovations for edge/IOT and also integrating them for end-to-end vertical focused solutions. Recent announcements of enterprise class micro-modular data centers (Micro-MDCs), Pulse IoT Center, Project Dimension and Project Iris are just a few. Dell EMC is also leading the work on standardization of edge infrastructure management with DMTF Redfish standard and extending it to cover micro-MDCs and associated DCIM infrastructure in collaboration with ASHRAE and Green Grid Consortium. Stay tuned for more to come. To summarize, edge computing is driving new class of distributed and decentralized architecture concepts and only the companies driving innovations to optimize for this will win in the long term.